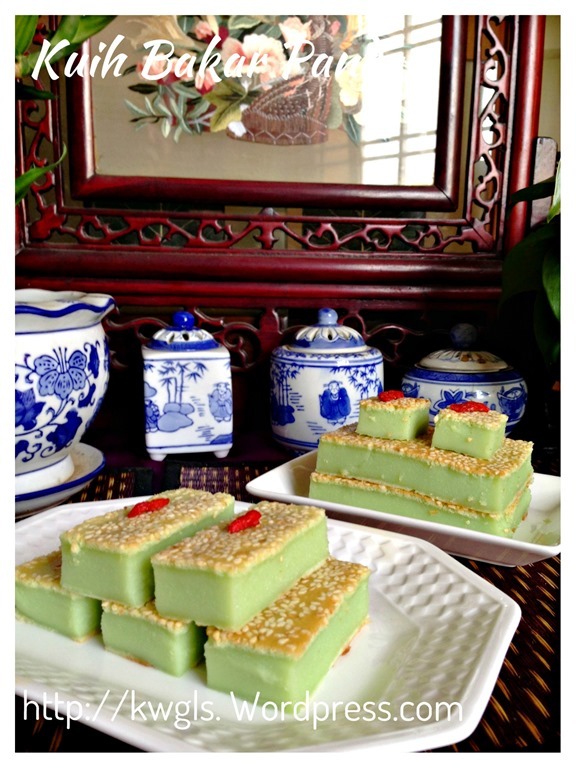 This kuih is very much like a baked custard that is full of Pandan and egg aroma. 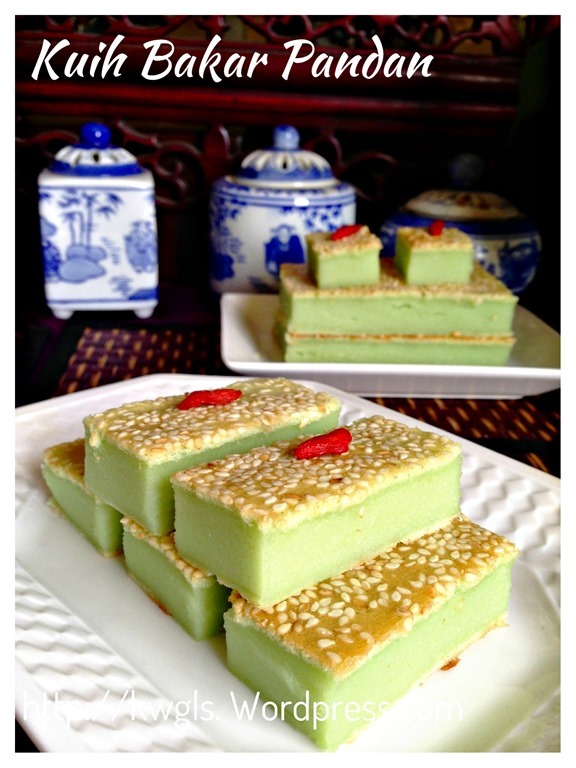 It is soft and resembling biting the top green custard layer of the Kuih Salat or Kuih Seri Muka. 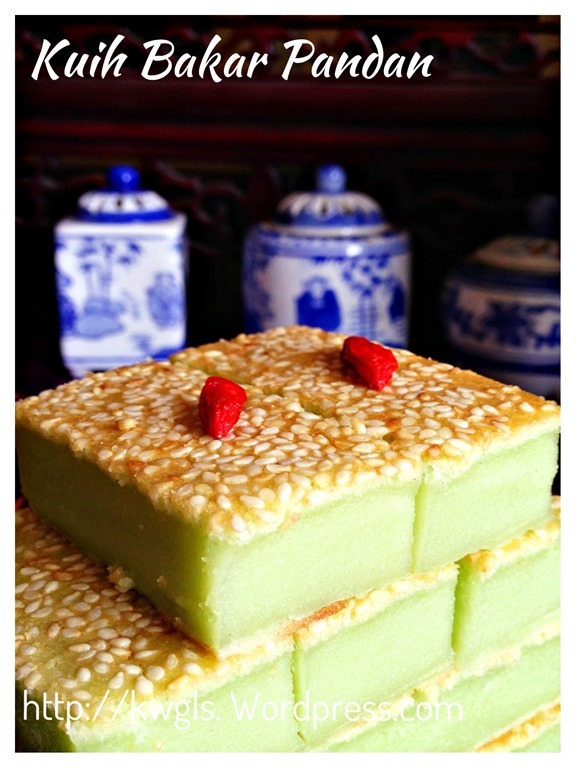 That is understandable as the ingredients are very similar except for this kuih, plain flour is used and baked. 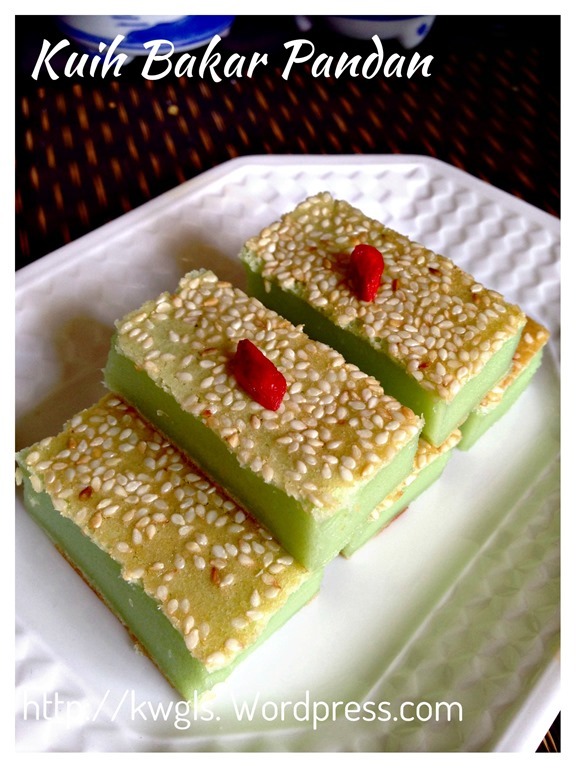 The name of this kuih is Kuih Bakar or in Indonesia, it is called Bingka Bakar. 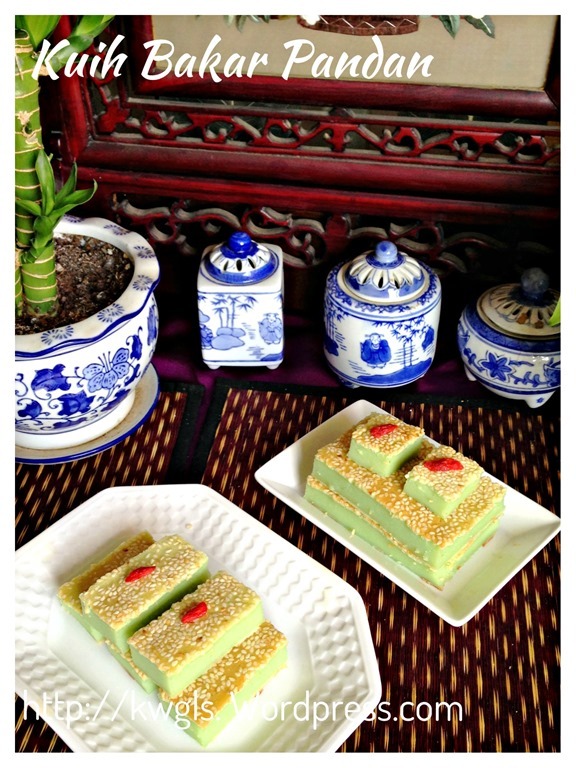 It is also called Kuih Kemboja possibly because the traditional bronze mould used for the preparation of this kuih that resembles a flower plumeria or Kemboja in Malay language. 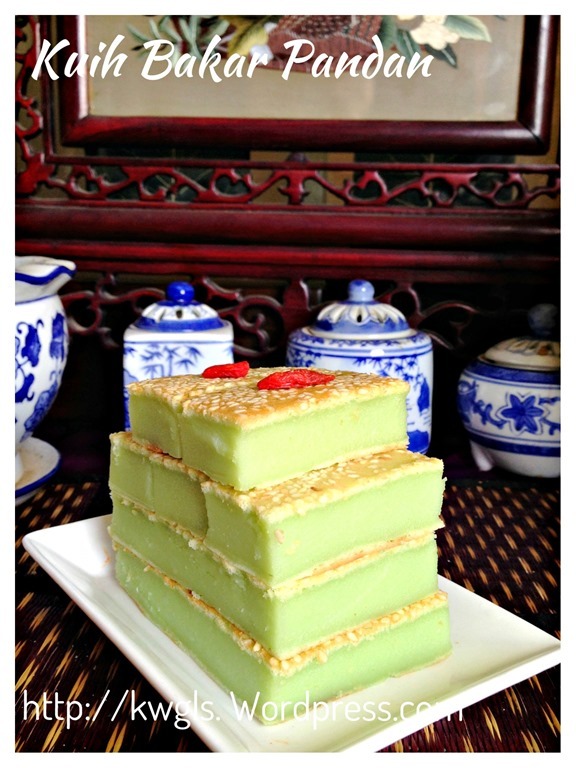 It’s flavour can be plain or with Pandan flavour. 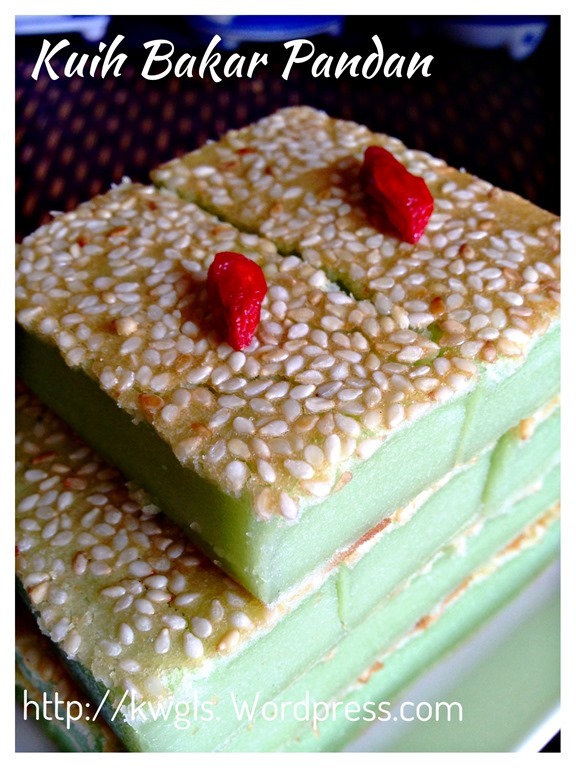 “’Kuih bakar adalah sejenis kuih tradisional Melayu. Ia biasanya bewarna hijau kerana menggunakan daun pandan sebagai pewarna. Ia juga berbau harum wangi pandan. 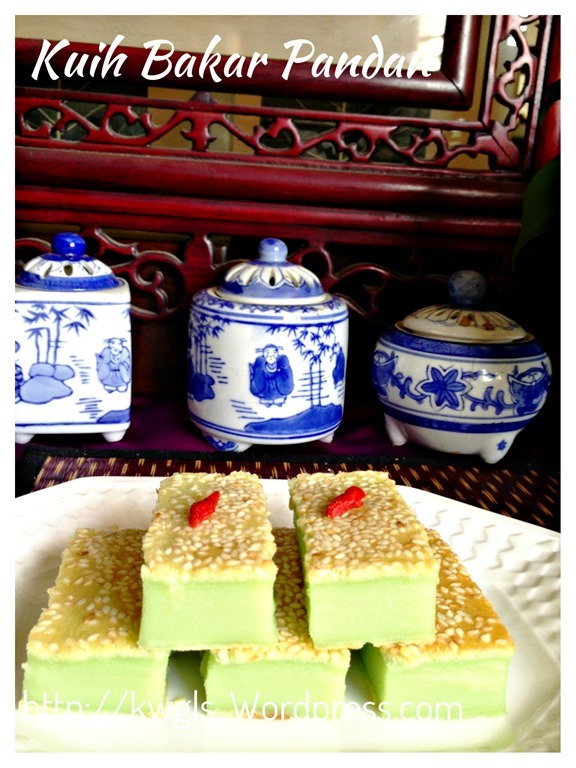 Kuih bakar biasanya agak manis dan berasa telor.” (Source: http://ms.wikipedia.org/wiki/Kuih_bakar) – ‘It is written Kuih Bakar is a traditional Malay cake , usually green in colour because of the usage of Pandanus Leaves. 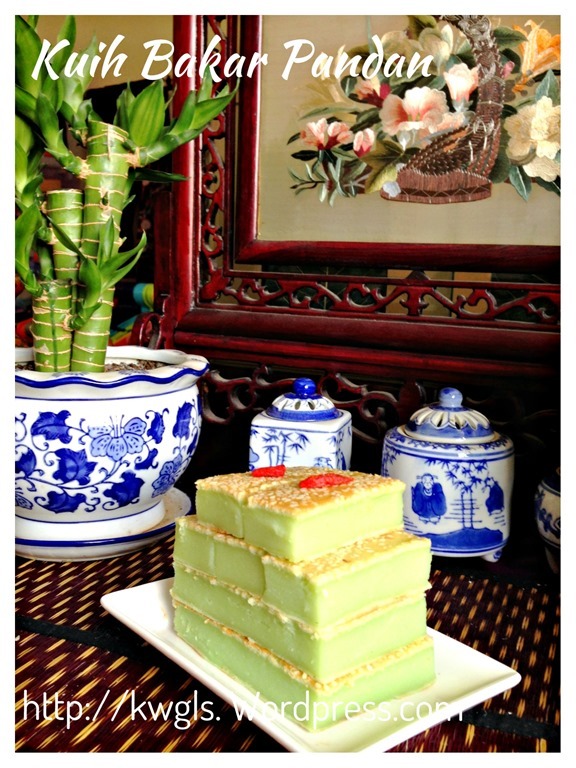 It is sweet and comes with a Pandan and egg fragrance. In this illustration, I have in fact baked 2 trays, one using the round baking tin and another using square baking tin. 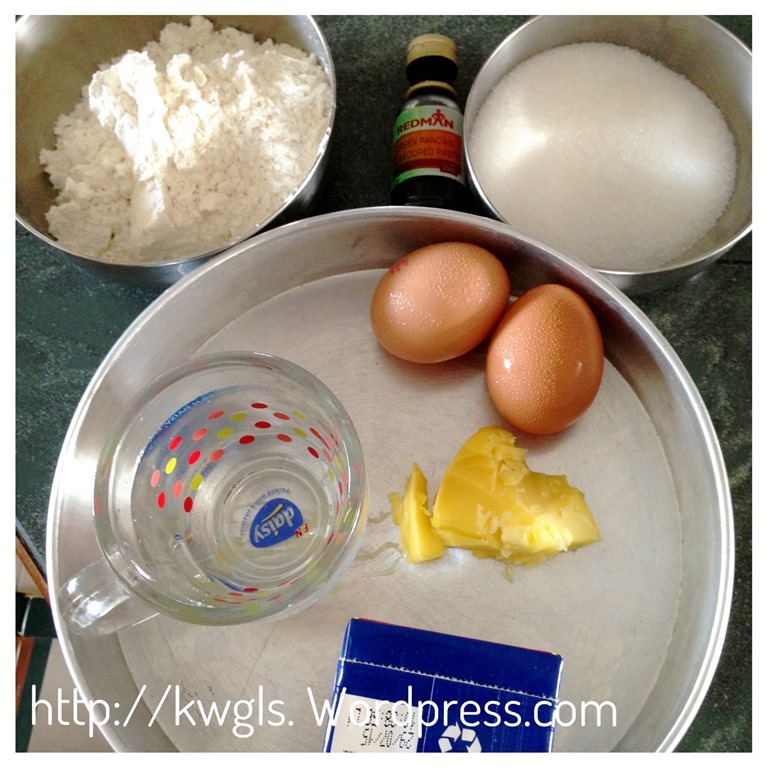 Therefore, the picture that I have taken may cause confusion if you see the square and round baking tin.. Pardon me for that. Greased the baking tray with some melted ghee or butter and pre-heat the oven to 180 degree Celsius. Beat eggs egg and sugar until well combined and sugar have dissolved. 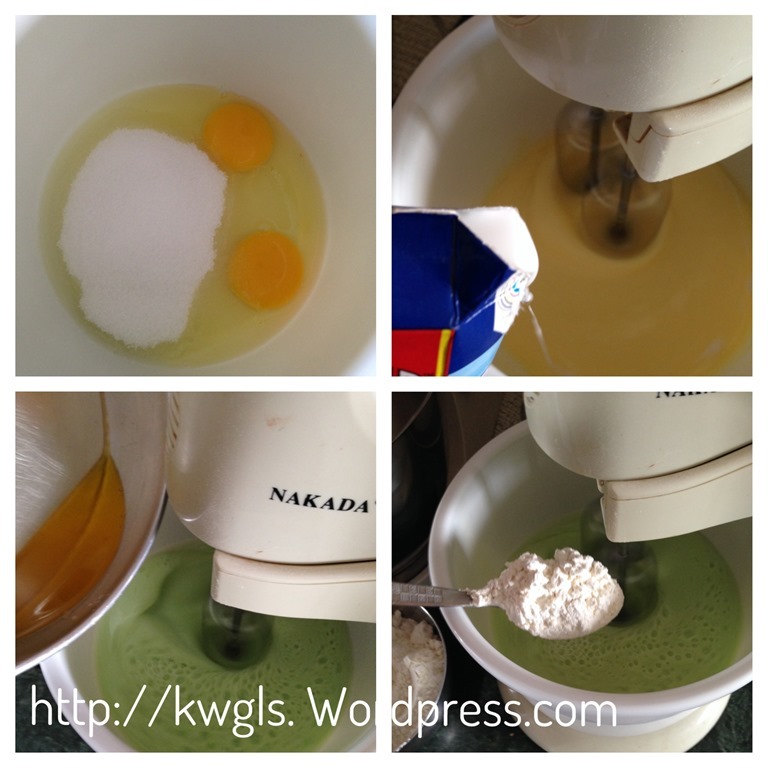 Add in the plain water, coconut milk, pandan juice (or pandan flavouring) followed by melted ghee or butter. Once all well combined, add in the sifted plain flour, use the machine’s slowest speed (or fold in manually ) to stir until well mixed. Transfer the batter out to the greased baking tin. 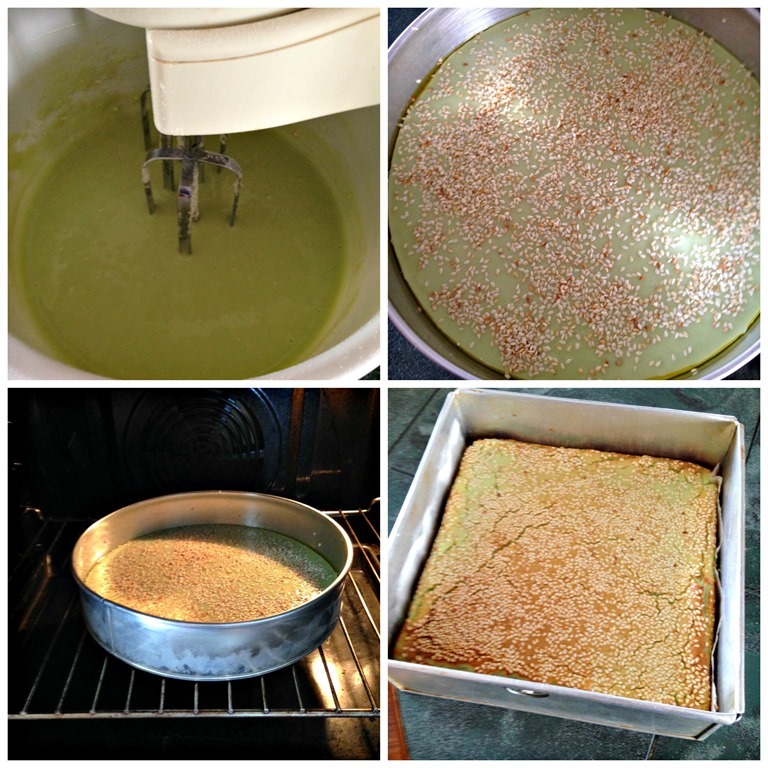 Sprinkle sparingly with sesame seeds and baked in the pre-heat oven for 30-45 minutes or until the top is golden brown and a skewer inserted into the centre of the cake comes out clean. Note that baking time will very much depends on the size of the baking tin used. The taller the cake, the more difficult it is cook the cake. You have to use your judgement. As long as the cake is set, it is consider as cooked, It is common that the sides of the cake will rise slightly higher than the centre. Cool completely before cutting into desired sizes. If you have never eaten this kuih before, which is rather unlikely, try to imagine you are taking a bite of a firmer Kaya (coconut Jam) or the firmer top part of the Kuih Seri Muka . I am sure you will start to like it. 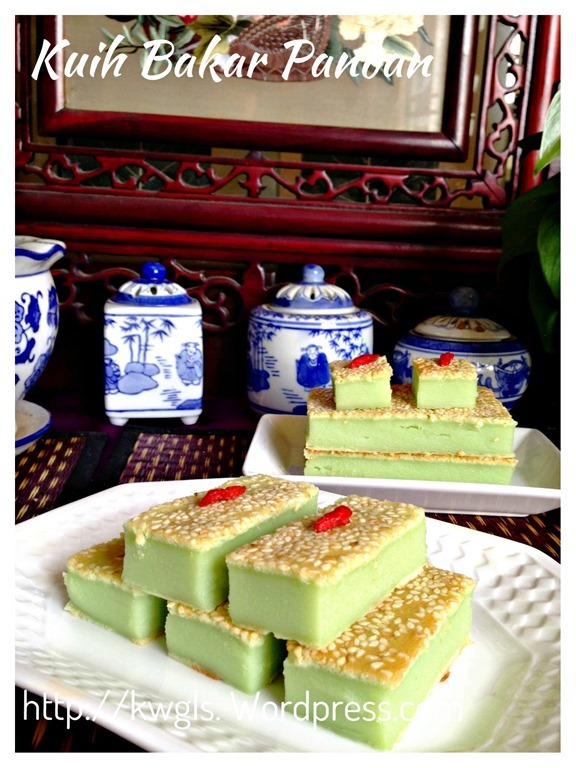 This entry was posted in Chinese and Asian Cakes and Snacks, Food Preparation Series and tagged 8, 香兰烘糕， kuih bakar pandan, GUAI SHU SHU, Guaishushu, kenneth goh, kuih kemboja, postaday. Bookmark the permalink. Oh my, that looks delicious! I would love to try a piece! Oh my ! That looks wonderful! I want to try baking this. Is it ok to bake it in a 7″ square pan with the same amount of the ingredients? U mean hv to increase the baking time ? Can I store the cake in room temperature for overnight? Thanks a lot, will try this weekend. Can I use 9″ x 13″ baking pan instead? Yes, it will be thinner and should have shorter timing.